Sometimes you need the whole picture. In biomedical research, that means whole-animal imaging. While these techniques can’t be applied directly to clinical problems, optical whole-animal imaging can aid in research. It also can point the way to probes that can be used clinically. Woburn, Mass.-based Cambridge Research & Instrumentation Inc. (CRi) provides optical whole-animal imaging via products in its Maestro line. These are automated small-animal imaging systems that include both quantitative multispectral fluorescence and low-light imaging modes. They also use a technique called dynamic contrast enhancement to do all-optical kinetic imaging. The use of multiple fluorophores and the spectrum from 500 to 950 nm helps minimize the impact of autofluorescence. In a mouse, for example, the reaction of tissue to interrogating light generates unwanted fluorescence. This generalized emission can mask the signal from a fluorophore that is inside a tissue sample of interest. “Multispectral imaging can help you get beyond that limit, improving your signal-to-noise ratio. People have published 300 times better signal-to-noise,” said James Mansfield, director of multispectral imaging systems at CRi. Multispectral imaging that spans the visible to near-infrared wavelengths can enhance the contrast of whole-animal imaging and improve the ability to quantify results. Here, the signal is unmixed from autofluorescence, with the signal of interest then easily seen and quantified. Courtesy of Cambridge Research & Instrumentation. A benefit of this approach is the ability to use multiple fluorophores across the instrument’s entire spectral range. 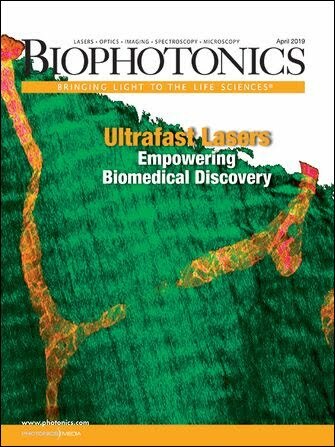 Using longer wavelengths helps minimize autofluorescence and increases tissue penetration. The company’s dynamic contrast enhancement technology uses the different rates that injected dye move through organs and tissues to extract information about the temporal biodistribution of fluorescent markers. One of the biggest applications of the technology eventually will involve studies of the time-dependent interaction of drugs with various tissues and organs in small animals, Mansfield said. Today, those applications await the development of suitable chemistries, models and software. As for the company’s imaging systems, they can produce resolution of 25 μm per pixel. At a lower resolution, they can capture images of three mice at a time. A full multispectral image can take as little as 10 to 15 s, with monochrome ones taking a fraction of a second. As for the future, he noted that the spectral range is unlikely to expand. Wavelengths below 500 nm do not penetrate tissue well, which hampers whole-animal imaging. Above 950 nm, there’s a lack of fluorophores, and silicon-based sensors begin to lose effectiveness at slightly longer wavelengths. To see how whole-animal imaging is being used, consider the molecular imaging program run by the Bethesda, Md.-based National Cancer Institute, part of the National Institutes of Health. Peter Choyke, who heads the program, said that its mission is to develop new imaging techniques to accelerate the development of cancer therapies. Whole-animal imaging plays a role in this, although not a direct one. “We begin in the preclinical arena with animals, do the initial testing there and then translate those findings into the clinical area,” Choyke said. In doing this, the group develops probes that target cancer cells, binding to the cells in the way that keys fit into specific locks. Properly constructed, the probes will adhere only to those cells with the right surface characteristics. Choyke said that an example of the strategy might be the linking of a photoactivatable fluorophore to a ligand. The ligand would bind to cancer cells, thereby activating the fluorophore and enabling determination of the cancer’s location. Along with other imaging equipment, the molecular imaging program’s researchers use a multispectral whole-animal imaging system from CRi in their investigations. The imaging technique cannot be ported into clinical use, however. For one thing, fitting an entire person into an instrument would require scaling up the system significantly. For another, the light from optical probes would have trouble emerging from deep within a patient, making detection difficult or impossible. Finally, spectral imaging is time-consuming, and most clinical applications require near-real-time temporal resolution, Choyke noted. But, he added, the probes developed using the technique can prove useful. After being evaluated on animals, the most promising can then move on, perhaps eventually being used in clinical diagnostics. VisEn Medical Inc. of Bedford, Mass., is another company that offers whole-animal imaging systems. The company’s 3-D fluorescence molecular tomography, or FMT, technology comes in its aptly named FMT 2500 system. Its latest incarnation has four channels that span from 635 to 790 nm, and it’s used in conjunction with the company’s probes. Here, a spontaneous ovarian tumor model is quantified using fluorescence molecular tomography and VisEn Medical’s ProSense fluorescent probe. The range of colors in the tumor image represents the heterogeneity of the tumor-specific signal. Mouse model and image courtesy of Drs. D. Connolly, M. Clapper and H. Hensley, Fox Chase Cancer Center. The goal is to do quantitative molecular imaging, said Wael Yared, VisEn’s chief technology officer. By capturing the molecular signal of the underlying biological processes, the progress of a disease or its reaction to a therapeutic agent can be tracked and evaluated. The company’s devices offer quantification of picomole concentrations in deep tissue targets, thereby supplying information about the location and strength of the signal. Achieving this requires control of both the instrumentation and the probes, because they interact with one another. A probe that is bright in a biologically dark part of the spectrum and is highly specific could produce good results, even if the hardware is less than stellar. Conversely, very good hardware with highly effective detectors and filters might be able to overcome poor probe performance. Thus the two can reinforce, weaken or even cancel each other out. This interrelationship is one reason why VisEn offers both probes and instrumentation. There’s actually a third component in this equation, Yared said. That’s the biology associated with the signal. If it’s especially strong, it can affect findings, particularly if quantitative results are desired. To account for this, Yared said the company uses a rigorous calibration step. Imaging a mouse takes several minutes with the system, but the result is a three-dimensional image that quantifies the probe in question within the biology. The data also can be co-registered with other imaging modalities, such as computed tomography, positron emission tomography, single-photon emission computed tomography or magnetic resonance. These other imaging methods, Yared noted, provide anatomical data, or information that is indicative of changes in the shape or morphology of the tissues involved. Company plans call for the release of new probes and systems, with the former including a probe to target apoptosis, or programmed cell death. The latter will include further system improvements. Both are expected fairly soon. As for the future, Jeffrey Peterson, the company’s vice president of applied biology, noted that imaging an entire animal is important for understanding such things as autoimmune responses in the brain or pancreas. It’s also vital for arthritis, he said.